facilities provide endless possibilities for staging a convention of the highest quality. Grieghallen is Bergen’s largest convention centre: Dovregubbens Hall is 3,500 square metres in size and Edvard Griegs Plass outside is 5,000 square metres. In addition, Grieghallen’s foyers and Peer Gynt Hall can also be utilised for conventions of various sizes. Here, we provide everything for a successful exhibition and convention at a high international standard. Around 15 exhibitions and conventions take place in Grieghallen every year. Among these are the annual Utdanningsmesse (Education Fair) and the sports convention Fritt & Vilt. Fritt & Vilt is the biggest sports convention in western Norway, attracting 30,000 guests annually. The convention organisers take advantage of the opportunity to use Dovregubbens Hall together with Edvard Griegs Plass outside. Therefore, they can have 60 exhibitors shared across 3,500 square metres inside and use the 5,000 square metres outside as an activity area. 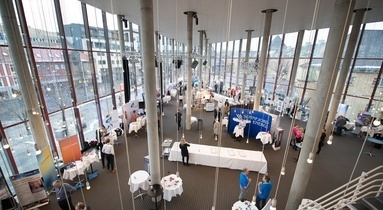 Grieghallen’s unique and adaptable facilities make it a first-class choice for all types of events, be it conventions, exhibitions, conferences or congresses. 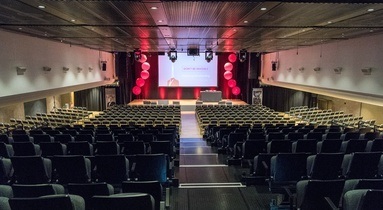 Grieghallen has well-lit and pleasant meeting and group rooms in addition to multiple well-equipped auditoriums. All venues are extremely user friendly and can be customised for every need. We also have extensive experience with serving food and drinks for conventions and exhibitions. Grieghallen is a great place to stage events that will attract a lot of people. Nearby, beneath Edvard Griegs Plass, is a 420-space car park, and its ground floor has been specially surfaced for use in connection with conventions, trade fairs and other large events. Extending for 3,500 square metres and with a ceiling height of almost five metres, there is plenty of room to being in large exhibition equipment. Grieghallen’s professional and experienced associates within audiovisual and lighting technology are the leading experts in the Nordic region and provide the latest in technological facilities. First-class equipment and the opportunity for on-site support ensures that your exhibition or convention will be perfectly executed, whether it involves a multimedia show, artistic performances, PC/video projecting or video conferences, interpreting equipment, etc. Furthermore, our associates and project managers actively contribute to the planning phase in order to assure the event’s high quality.